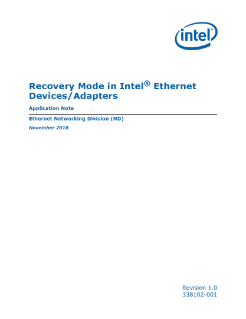 Networking Division (ND) - In Release 23.4, Intel has implemented a Recovery Mode capability that increases the resiliency of the Ethernet solution by enabling recovery of a corrupted or misconfigured NVM. Examples of events leading to this include partial or failed device firmware upgrade or downgrade attempts, or device driver installation errors. The enhancement adds a NIC Recovery capability ...(referred to as Recovery Mode) that is available in this release. Hibbert # 338102. At Intel IT, failure is acknowledged as a necessary part of the innovation process. Andy Veluswami, Director of Analytics for Change.org, discusses how AI can be used to amplify the voice of individuals. Why Intel? Female Execs Share their thoughts.